What a year. What a jerk of a year. I think every year finds people sorting it into a winning year or a losing year. I have a lot to be grateful and thankful for here at the start of 2010 (Twenty-ten! The future!) but there were parts of 2009 which were terribly trying. The bright spots, for me, revolved around cheese and for that I can’t complain. 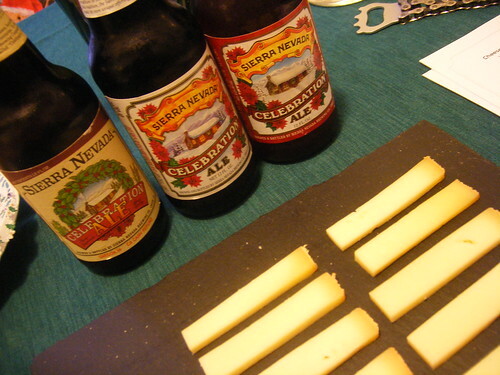 FUCheese started off the year with a revelatory cheese and beer tasting put on by Saraveza and Steve’s Cheese. It kicked off a true obsession with pairing these two fine items and I spent most of the year trying new combinations and doing my best to spread the beer/cheese love. In March, we packed up the car and stayed in a yurt in the Rogue River Valley to attend the 5th Annual Oregon Cheese Guild Cheese Festival in Central Point. We had so much fun at the festival and met some awesome people. 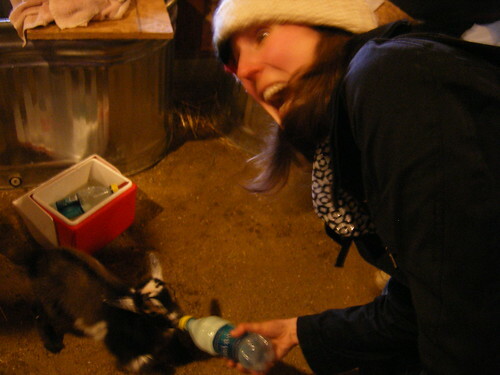 We also visited Vern and Gianaclis at Pholia Farm which kicked off a love of goats. I still haven’t been brave enough to milk one yet. New Year’s resolution? In April, we made mascarpone, more yogurt and had some iffy cottage cheese. I also attended a hard cheese class at Kookoolan Farms which convinced me that we needed to get back on that horse and give hard cheeses another try. Did we? No. Another resolution, perhaps. Nicole and I hit the road again, this time north to Seattle for the cheese festival at Pike’s Place Market. We went as volunteers and worked at the Peterson tent taking in money and handling out samples. It was a total blast and we may do it again this year. This time we’ll have to walk out of there with more cheese. We were just so overwhelmed after finishing our shift that it was all we could do to visit some of the smaller cheesemakers for samples and then go collapse in the park. In the summer, I was too busy camping, BBQ-ing and drinking beer to spend too much time in the kitchen. I got my first paid gig doing a pairing of cheeses and beers. Profits, admittedly, were a bit low because I bought waaay too much really awesome fancy cheese and paired it with incredible (and expensive) beers. It was a total blast, though, and everyone had a great time and – bonus! 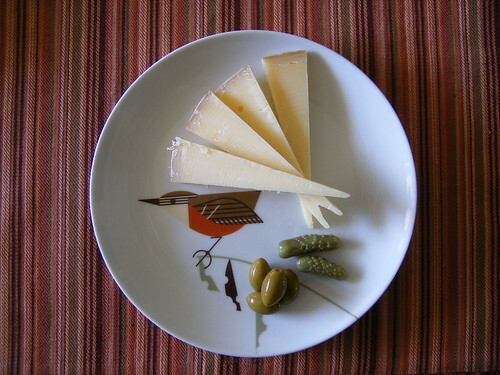 – we had enough cheese left over to put together a handsome platter for a dinner party of 6 the following weekend. I have done a couple more pairings for groups since then and my portioning is getting more under control. 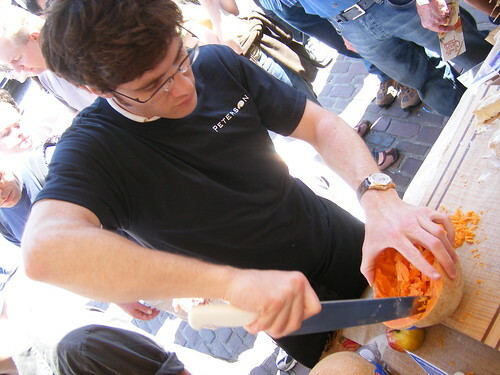 I also spent a fair bit of my summertime involved in putting together the Portland Cheese Festival. I somehow wrangled my way onto the planning board and met some great people in the process. The festival went off really, really well. Feedback was – and continues to be – incredible. The cheesemakers brought amazing stuff and the location turned out to work pretty good. Hopefully when it comes around again, I’ll be able to get involved and build on what I learned with the last one. You’ll be there, too, right? Sadly, this is where an already bumpy year for personal reasons got downright depressing. My father passed away at the end of October after a fierce, year-long battle with cancer. He was a good military man and, really, still too young to go. He loved hearing about the cheese festival and all our adventures with cheese. He was a big cheese fan (also smoked anchovies, hot mustard, oysters and other Scandinavian treats and terrors) and it was really tough to lose him. However, his death opened my eyes to what it means to have people in your life who truly care about you and for that I am so very thankful. The end of the year rounded out with more goats, excellent cheese plates and a beer/cheese pairing challenge! My friend Bruce, a die-hard beer nerd and curator of fine brews decided it was time to pull up some beers from his cellar and do a tasting. He asked if I could pair some cheeses with his eclectic collection. Since I couldn’t pre-sample these beers due to their rarity and age, I went off of tasting notes from the brewers and other beer writers and his own recollection of what these tasted like or should taste like. A 3-decade vertical of Sierra Nevada Celebration – 2009, 1999, 1989! – paired with a pungent and footy Canadian cheese called Charleudix. The pairings turned out really well and everyone had their favorites. The one pictured above was a huge hit. That cheese was incredibly stinky and I made everyone take a good sniff before I portioned it out. They were scared, for sure. However, it was a wonderful and creamy cheese with a lot of flavor and balanced with the hops notes of the ’99 and ’09 quite well. Poor, old ’89 tasted like it had almost no hops left at all. I couldn’t have asked for a better cap to the year, surrounded by some of my favorite things in life: good beer, great cheese and fantastic friends. So, to more of that in 2010! Mmmmm charleudix! That’s certainly no From Under cheese!